OTTAWA—The Bank of Canada says it sees some encouraging signs in the Canadian and global economies, but warned that inflation remains too low to justify moving off its view that the recovery remains fragile and in need of monetary stimulus. As expected, the bank on Wednesday once again decided to keep in place its key rate at one percent, a level that has helped keep borrowing costs near historic lows for several years. 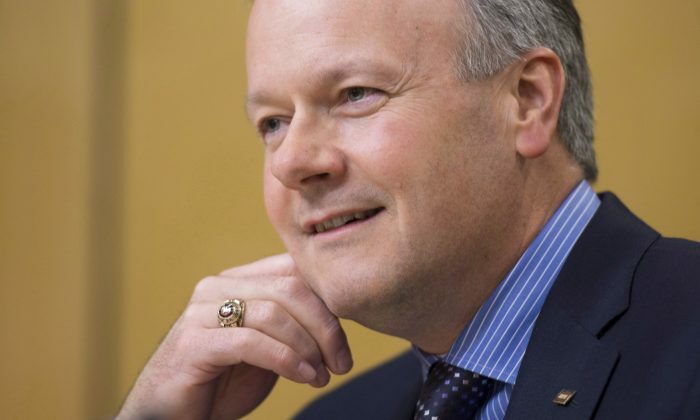 But markets did not read the statement as neutral, apparently interpreting the bank’s caution that “downside risks to inflation appear to be greater” as a signal governor Stephen Poloz intends to keep interest rates low for an extended period—likely well into 2015—and raising the possibility, although slim, of a rate cut next year. The Canadian dollar dropped 0.31 of a cent to 93.6 cents U.S.—its lowest level since May 2010—on the announcement. Analysts said that may be just what governor intended, as he continued to emphasize the need for Canada to pick up its exports performance before it can create self-sustaining growth. A weak currency helps exporters compete in foreign markets. “I think it’s quite telling that since the last meeting we’ve got better-than-expected growth and lower-than-expected inflation, and what does the bank focus on but the lower-than-expected inflation,” noted Doug Porter, chief economist with BMO Capital Markets. In October, Poloz unexpectedly dropped a tightening bias that had been in place for 18 months, with the result that the loonie fell immediately almost a full cent. The bank has repeatedly insisted it is not targeting a weak dollar, but Porter noted that other central banks, particularly in Australia and some other economies that lean on exports, have taken the direct route in openly talking their currencies down. RBC economist Dawn Desjardins said the weakening loonie versus the U.S. greenback provides additional support for Canadian exporters to take advantage of what is expected to be a long-awaited rise in demand in the United States. “Increased demand for exports will be a key factor in boosting the economy’s growth rate above its potential in 2014 and reducing the amount of excess capacity,” she said in a note to clients, while adding that the downside risks to inflation will ease. Statistics Canada said Wednesday the country’s trade balance with the world came to a surplus of $75 million compared with a deficit of $303 million in September. The shift came as imports slipped 1.2 percent while exports decreased 0.3 percent in October. The central bank announcement Wednesday, read as a whole, suggested the bank has not materially changed its mind about the trend of the economy since October’s rather gloomy monetary policy report, despite the fact that third-quarter growth was far stronger than it estimated. Porter said if the bank had said “ditto October” rather than emphasizing inflation Wednesday, it would have gotten no arguments from economists. In its analysis, the central bank acknowledged third-quarter growth, which was reported at 2.7 percent last month, was better than the 1.7 it had pencilled in in October, but essentially looked through the improvement. It said underlying conditions were weaker than it appeared, noting sustainable growth requires a rotation from domestic activity—in particular housing and consumer spending—to more export growth and businesses spending. That has not happened yet, it said. It also said it was encouraged that U.S. growth was stronger than expected, although it pointed out that some of that was due to temporary factors also. As Poloz emphasized in October and at recent appearances before House of Commons and Senate committees, the bank’s governing council is particularly focused on the low inflation rate, as an indicator of “significant excess supply” in the economy. Heightened competition in the retail sector, a likely reference to new entrants in the Canadian market, such as the Target chain, and lower gas prices, are also playing a role in low inflationary pressures, the statement said. That assessment is unlikely to significantly change the opinion of most economists and markets that Poloz expects to stay on the sidelines as far as adjusting interest rates throughout 2014, and that the first change will be a 25-basis point increase in the overnight rate sometime in 2015, with a slim chance of a rate cut if conditions deteriorate. Poloz appears sanguine about what is occurring in the Canadian housing market, even if some analysts fear a sharp correction. He took note of the recent resurgence in sales, but said it was “consistent with updated demographic data” and the view that some buyers jumped into the market to get ahead of expected mortgage rate increases. “The bank continues to expect a soft landing in the housing market,” it said. As for the global economy, it notes that it is expanding “at a modest rate” as expected.